Afternoon tea is a bit of a tradition in this country, isn’t it – everything stops for tea as they say – and there’s no doubt in my mind that a decent brew and a sweet treat (or two) has restorative powers when you hit the 4 pm slump and wine o’clock is rather a long way on the horizon. And what could be nicer than sharing the benefits by sending someone you love an afternoon tea in a box? 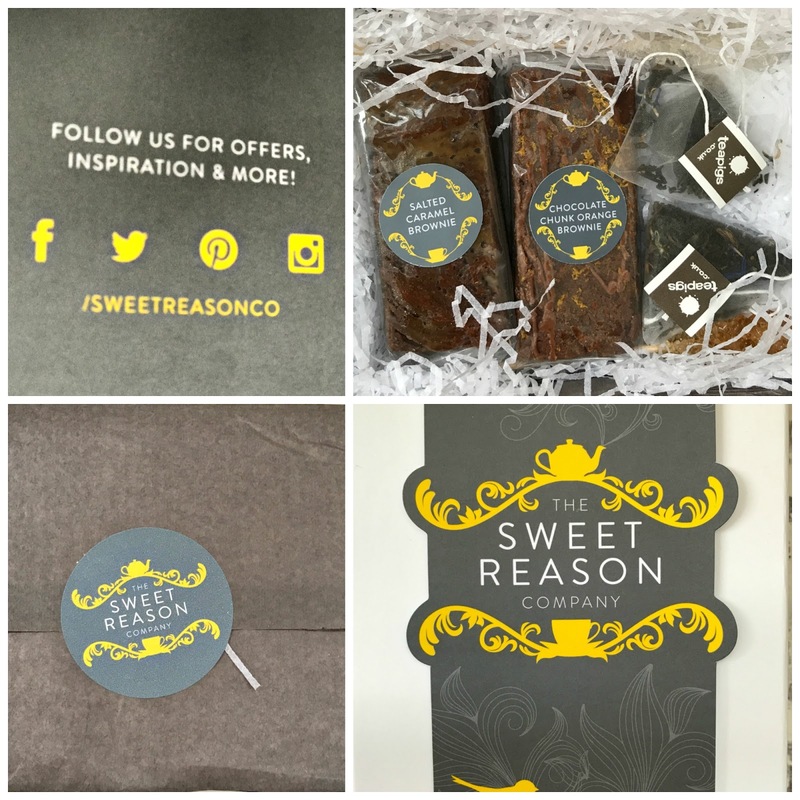 The Sweet Reason Company is a luxury gift company which has this all sorted by offering a delicious selection of gift boxes containing treats such as handmade brownies, bakes and Teapigs teas. These are all a little bit special – for a start you can have Millionaire’s Shortbread topped with gold glitter and the Salted Caramel brownies just ooze soft squidgy caramel chocolatey-ness into your mouth. You can have an afternoon tea box for up to four people or send a mini gift box with a couple of brownie bites. If you’re throwing a party you can even have a tower of brownie bites. This would have found greater favour with Ieuan than the Batman cake he had (again) for his 8th birthday. 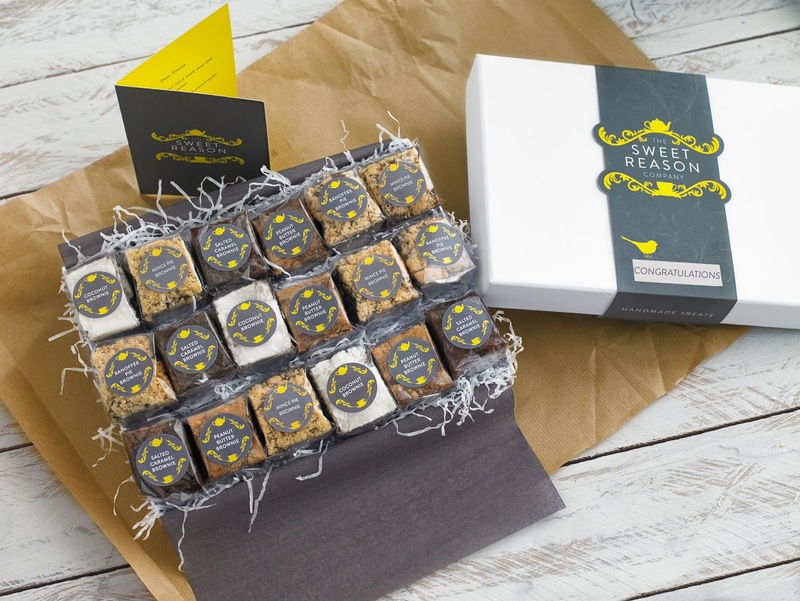 There are gluten free treats, wedding favours and even a monthly box on a 3, 6 and 12 month subscription containing a selection of brownie bites and teas. The Sweet Reason Company has been featured in Vogue, Delicious Magazine, Stylist and Sheer Luxe so I was expecting a luxurious treat box – and I wasn’t disappointed. I was sent an Afternoon Tea For Two Box (£14.50) which contained two lovely gooey brownies, two pretty sugar swizzle sticks (one brown sugar, one white) and two Teapigs teabags to match the bakes – Salted Caramel Brownie and Chocolate Chunk Orange Brownie. Each brownie is a pretty decent size by the way although I did the altruistic thing (or made the grave mistake) or sharing mine with the Husband and kids. Why did you think? I asked. Is there more, they said. I’ll be hiding my next box. If you would like to try The Sweet Reason’s brownies for yourself, then I have an Indulgent Box Of Brownies to be won by one sweet toothed reader of this blog. Worth £34.90, the Indulgent Box has 15 bites in their popular Salted Caramel, Chocolate Orange Chunk, Peanut Butter, Honeycomb, Mojito and Oreo & Coconut flavours. The brownies are presented in a luxury box and everything is hand wrapped and packed. The outside of the box is personalised with your box name and there is a personalised greeting card inside. To enter you MUST visit The Sweet Reason Company’s website and sign up for their newsletter on their home page. This will also give you a 10% discount off your first order. You can either sign up via the link below or via the Rafflecopter widget where you can earn extra entries towards this lovely prize. The usual terms and conditions apply which can be viewed on my competitions page. UK entrants only. The giveaway ends at 11:59 pm on Friday 18th August. "Encouraging Your Kids To Travel Could Be One Of The Best Things You Do For Them"
"Organic V Free Range Milk – Do YOU know the difference asks Arla?" Wow theses look so good! My daughter would enjoy using these!